Read that on someone’s blog and thought it was great (sorry I forgot to reference the original blog source). January (even though it is mostly over) is usually the month we all get real impulsive and decide to organize our lives (eating habits, exercise habits, and yes even our stash and needle nests). My impulsiveness was happily contained by my bout with the flu; no diet for me and it’s much too cold to even think about a walk to the front door let alone around the block. 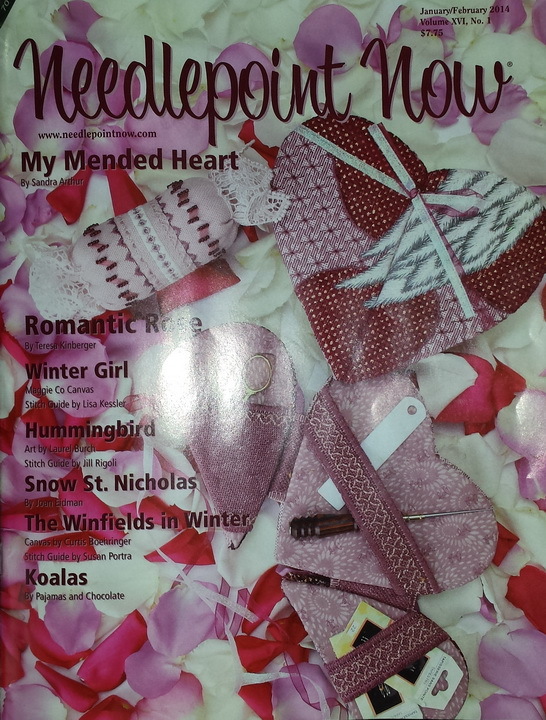 But while I was recouping my January/ February issue of Needlepoint Now (www. Needlepointnow.com) arrived…and just in time too, I was about to suffer from complete needlepoint withdrawal since I had not stitched in two weeks. I read EVERYTHING even the page numbers on every page 🙂 . And there within these pages were others talking about organizing their stash and needlenests. I like the rest of us who have more than a dozen different threads have contemplated for years: store by color or thread type, that is the question. ED NOTE: if you know needlepointer that only has only a dozen threads , you need to have an intervention quickly…that needlepointer is having a needlepoint breakdown So, quickly have several friends send her a few extra threads so she too may contemplate the age old question: color or type? stash is sorted by thread type in boxes in my thread closet that when we remolded the office I had them leave the doors off. So from my desk I can see all the threads, it makes me feel all warm and fuzzy. 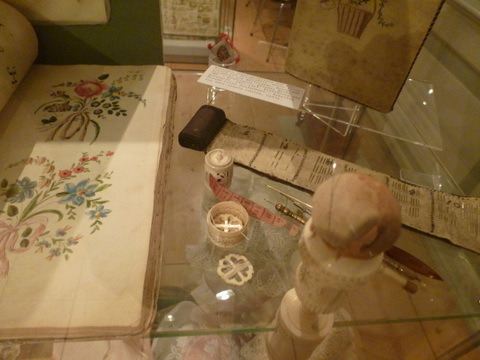 Most of the drawers are Rainbow Gallery and these threads are stored by type: Splendor, color: yellow, number 1,2,3.. The larger boxes are also by supplier: Caron: Impressions, Brown Paper Packages: Silk n Ivory; DMC flouche…and these are sorted on rings by color and then numerically. All the overdyes are in boxes by name or number which even the thread manufacturer suggests. I have two boxes from the hardware store; one holds Kreinik by size and color and the other has Needlepoint Inc silk by color and Trebizond by color. Most of the floss and perle coton are being converted to large plastic floss cars and stored in divide craft boxes. And this works for me. And I have a new addition to enhance my stash collecting and needle nest. 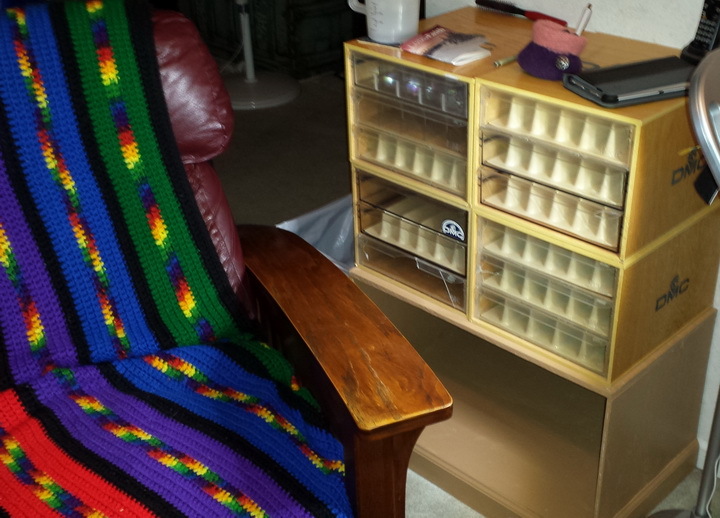 Last year when a local needlework shop closed I purchased at the auction four empty DMC floss cabinets. I drew up a base that I wanted to have made and asked my husband to make it for me. Life happens and the stand got put on the back burner but not forgotten. Last week-end the base was finished and now sits next to one of my needlenests waiting for me to fill it up. Oh what is better than a stash area waiting to be filled! 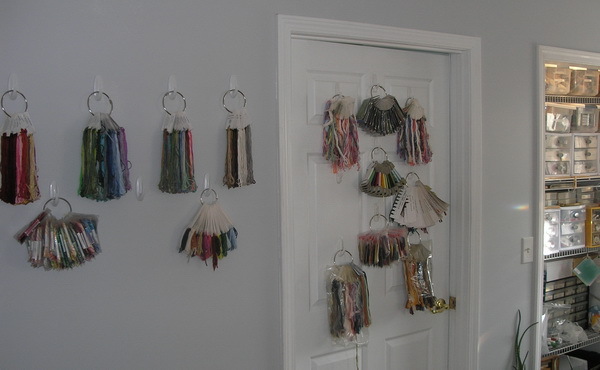 And yes I have more than one needlenest…I have to have a place to stitch in all my favorite places…There is a place in the library with all my needlepoint books, a place in my office, one in the sitting area of our master bedroom and of course the family room too. My sons are constantly reminding me that when they were young and left their toys all over I would tell them to pick them up and take them to their rooms or the toy room. And I am just as quick to remind them that what I said was a case of “do as I say not as I do” ; or they can just blame it on getting old…I forget where my nest is and just make a new one…and if that doesn’t work for them: it is MY house I can do what I want. Okay I am off to fill my DMC drawers and have a good day, after all I only have three more days left in January to be impulsively organized (this compulsion usually abates itself by Valentine’s day.) And remember it does not matter how slow I go as long as long as I don’t stop until the drawers are full of stash…sorry Confucius for the play on your words. Two blog entries in two days unheard of in my world but just could not wait. This morning my friend M-TB posted a link to Needlepoint Nation Stash Exchange (http://www.facebook.com/#!/NeedlepointNationStashExchange) and there is a Pinterest site too. So of course I headed over to check it out, friended the place, began to explore AND naturally found something I cannot live without. So I have sent an inquiry and may be adding to my stash by the end of the day. Thanks M-TB, I think…not sure DH will be as happy as I will be. And as long as you are in Facebook don’t forget to friend Amy Bunger (http://www.facebook.com/pages/Amys-Golden-Strand/189965167681135). She is posting live from market…Oh more goodies. Mary Corbet ( http://www.needlenthread.com/) giveaway three Trish Burr butterflies so I will be headed to trish’s ste to get my own butterfly (http://www.trishburr.co.za/) or just go straight to the purchasing at ETSY (http://www.etsy.com/shop/TRISHBURREMBROIDERY) . And there are those canvases I have on my want list that pop into my mind every time I buy some other than them…Oh the annoying aggravation of “Stashites” the terminal ailment of never having or wanting too much needlepoint and its accompanying ailments: threads, accessories and books. And then I ended my email reading on a bittersweet note: Country Bumpkin sends out a newsletter and in that newsletter they told about a German Sampler Museum that is closing. So if you are going to or are in Germany you may want to make this a stop on your agenda. You can view this museum and wish you were going (I do) at Sabine Taterra web site (http://www.samplers-berlin.com/museum_celle_en.html). 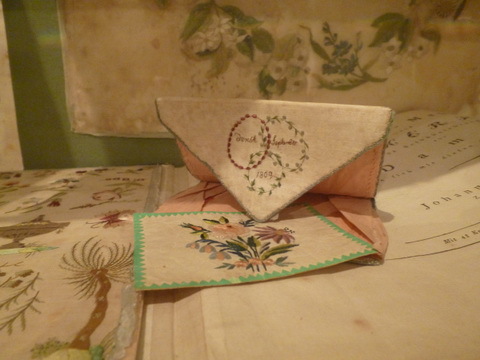 And while you are visiting Sabne’s site look around pretty cool, especially if you like samplers. I love to look at samples and I’ve stitched a few in my life but they are like quilts…I love them, want to have them just don’t want to stitch them. 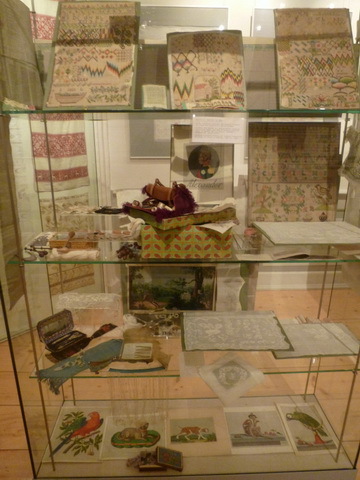 So this was a bittersweet referral; bitter that another stitch related museum is closing down and many of these lovely works will not be seen again but sweet in the fact that I found another website and blog to visit.